It is little known that lying underneath one of The United States largest and most picturesque National Parks - Yellowstone Park - is one of the largest "super volcanoes" in the world. Each year, millions of visitors come to admire the hot springs and geysers of Yellowstone, the Nation�s first national park. Few are aware that these wonders are fueled by heat from a large reservoir of partially molten rock (magma), just a few miles beneath their feet. As this magma-which drives one of the world�s largest volcanic systems-rises, it pushes up the Earth�s crust beneath the Yellowstone Plateau. Eruptions of the Yellowstone volcanic system have included the two largest volcanic eruptions in North America in the past few million years; the third largest was at Long Valley in California and produced the Bishop ash bed. The biggest of the Yellowstone eruptions occurred 2.1 million years ago, depositing the Huckleberry Ridge ash bed. These eruptions left behind huge volcanic depressions called �calderas� and spread volcanic ash over large parts of North America (see map). If another large caldera-forming eruption were to occur at Yellowstone, its effects would be worldwide. Thick ash deposits would bury vast areas of the United States, and injection of huge volumes of volcanic gases into the atmosphere could drastically affect global climate. A new University of Utah study in the journal Science provides the first complete view of the plumbing system that supplies hot and partly molten rock from the Yellowstone hotspot to the Yellowstone supervolcano. The study revealed a gigantic magma reservoir beneath the previously known magma chamber. This cross-section illustration cutting southwest-northeast under Yelowstone depicts the view revealed by seismic imaging. Seismologists say new techniques have provided a better view of Yellowstone’s plumbing system, and that the supervolcano hasn’t grown larger or closer to erupting. 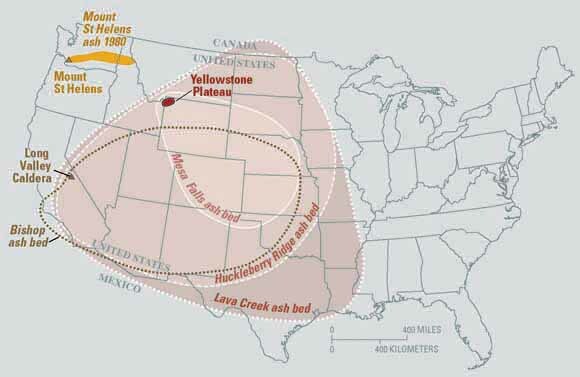 They estimate the annual chance of a Yellowstone supervolcano eruption is 1 in 700,000. Fortunately, the Yellowstone volcanic system shows no signs that it is headed toward such an eruption in the near future. In fact, the probability of any such event occurring at Yellowstone within the next few thousand years is exceedingly low. The term "supervolcano" has no specifically defined scientific meaning. It was used by the producers of The BBC TV show Horizion in 2000 to refer to volcanoes that have generated Earth's largest volcanic eruptions. As such, a supervolcano would be one that has produced an exceedingly large, catastrophic explosive eruption and a giant caldera. 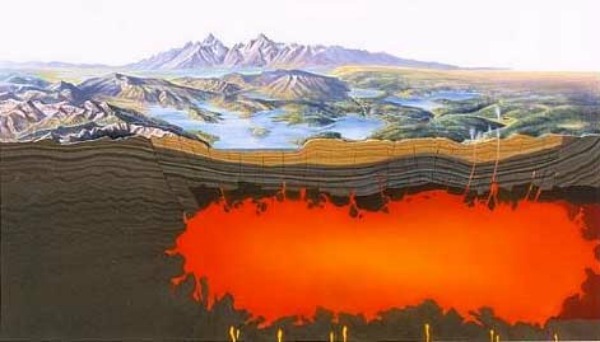 Supervolcanoes, however, begin life when magma rises from the mantle to create a boiling reservoir in the Earth's crust. This chamber increases to an enormous size, building up colossal pressure until it finally erupts. The explosion would send ash, dust, and sulfur dioxide into the atmosphere, reflecting the sun's rays and creating a cold wave lasting several years. Crops in many areas would fail and many species of animals and plants would face extinction. The Yellowstone region has produced three exceedingly large volcanic eruptions in the past 2.1 million years. In each of these cataclysmic events, enormous volumes of magma erupted at the surface and into the atmosphere as mixtures of red-hot pumice, volcanic ash (small, jagged fragments of volcanic glass and rock), and gas that spread as pyroclastic flows in all directions. Rapid withdrawal of such large volumes of magma from the subsurface then caused the ground to collapse, swallowing overlying mountains and creating broad cauldron-shaped volcanic depressions called calderas. The first of these caldera-forming eruptions 2.1 million years ago created a widespread volcanic deposit known as the Huckleberry Ridge Tuff, an outcrop of which can be viewed at Golden Gate, south of Mammoth Hot Springs. This titanic event, one of the five largest individual volcanic eruptions known anywhere on the Earth, formed a caldera more than 60 miles (100 km) across. A similar, smaller but still huge eruption occurred 1.3 million years ago. This eruption formed the Henrys Fork Caldera, located in the area of Island Park, west of Yellowstone National Park, and produced another widespread volcanic deposit called the Mesa Falls Tuff. The region�s most recent caldera-forming eruption 640,000 years ago created the 35-mile-wide, 50-mile-long (55 by 80 km) Yellowstone Caldera. Pyroclastic flows from this eruption left thick volcanic deposits known as the Lava Creek Tuff, which can be seen in the south-facing cliffs east of Madison, where they form the north wall of the caldera. Huge volumes of volcanic ash were blasted high into the atmosphere, and deposits of this ash can still be found in places as distant from Yellowstone as Iowa, Louisiana, and California. Each of Yellowstone's explosive caldera-forming eruptions occurred when large volumes of rhyolitic magma accumulated at shallow levels in the Earth's crust, as little as 3 miles (5 km) below the surface. This highly viscous (thick and sticky) magma, charged with dissolved gas, then moved upward, stressing the crust and generating earthquakes. As the magma neared the surface and pressure decreased, the expanding gas caused violent explosions. Eruptions of rhyolite have been responsible for forming many of the world�s calderas, such as those at Katmai National Park, Alaska, which formed in an eruption in 1912, and at Long Valley, California. If another large caldera-forming eruption were to occur at Yellowstone, its effects would be worldwide. Thick ash deposits would bury vast areas of the United States, and injection of huge volumes of volcanic gases into the atmosphere could drastically affect global climate. Fortunately, the Yellowstone volcanic system shows no signs that it is headed toward such an eruption. 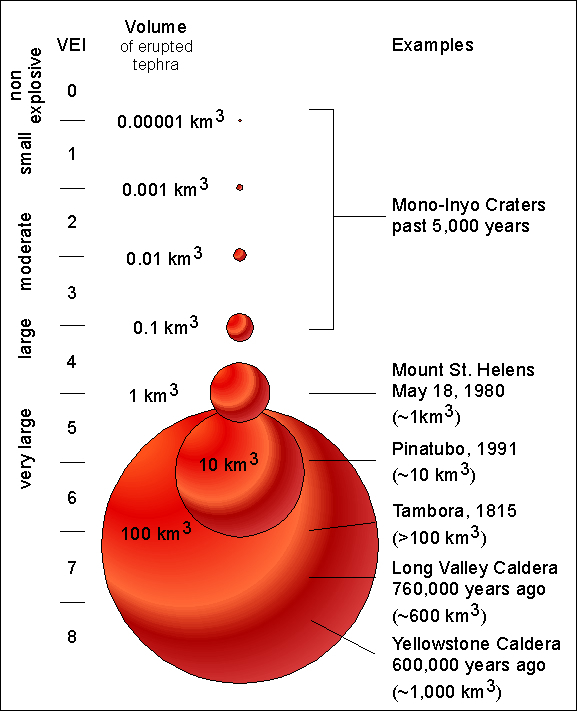 The probability of a large caldera-forming eruption within the next few thousand years is exceedingly low. More likely in Yellowstone than a large explosive caldera-forming eruption is eruption of a lava flow, which would be far less devastating. Since Yellowstone's last caldera-forming eruption 640,000 years ago, about 30 eruptions of rhyolitic lava flows have nearly filled the Yellowstone Caldera. Other flows of rhyolite and basalt (a more fluid variety of lava) also have been extruded outside the caldera. Each day, visitors to the park drive and hike across the lavas that fill the caldera, most of which were erupted since 160,000 years ago, some as recently as about 70,000 years ago. These extensive rhyolite lavas are very large and thick, and some cover as much as 130 square miles (340 km2), twice the area of Washington, D.C. During eruption, these flows oozed slowly over the surface, moving at most a few hundred feet per day for several months to several years, destroying everything in their paths. From 1,000 to 3,000 earthquakes typically occur each year within Yellowstone National Park and its immediate surroundings. Although most are too small to be felt, these quakes reflect the active nature of the Yellowstone region, one of the most seismically active areas in the United States. Each year, several quakes of magnitude 3 to 4 are felt by people in the park. Although some quakes are caused by rising magma and hot-ground-water movement, many emanate from regional faults related to crustal stretching and mountain building. For example, major faults along the Teton, Madison, and Gallatin Ranges pass through the park and likely existed long before the beginning of volcanism there. Movements along many of these faults are capable of producing significant earthquakes. The most notable earthquake in Yellowstone�s recent history occurred in 1959. Centered near Hebgen Lake, just west of the park, it had a magnitude of 7.5. This quake caused $11 million in damage (equivalent to $70 million in 2005 dollars) and killed 28 people, most of them in a landslide that was triggered by the quake. Geologists conclude that large earthquakes like the Hebgen Lake event are unlikely within the Yellowstone Caldera itself, because subsurface temperatures there are high, weakening the bedrock and making it less able to rupture. However, quakes within the caldera can be as large as magnitude 6.5. 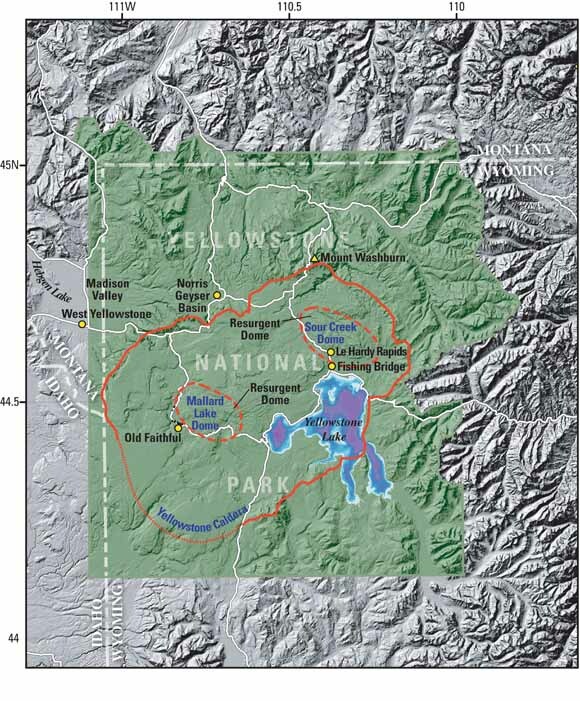 A quake of about this size that occurred in 1975 near Norris Geyser Basin was felt throughout the region. Even distant earthquakes can affect Yellowstone. In November 2002, the magnitude 7.9 Denali Fault earthquake struck central Alaska, 1,900 miles (3,100 km) northwest of Yellowstone. Because this quake�s energy was focused toward the active Yellowstone volcanic and hydrothermal system, it triggered hundreds of small earthquakes there. The region's hydrothermal system is highly sensitive to quakes and undergoes significant changes in their wake. Earthquakes may have the potential to cause Yellowstone's hot-water system to destabilize and produce explosive hydrothermal eruptions. The large magma reservoir beneath Yellowstone may have temperatures higher than 1,475F (800C), and the surrounding rocks are heated by it. Because of this, the average heat flow from the Earth's interior at Yellowstone is about 30 times greater than that typical for areas elsewhere in the northern Rocky Mountains. As snowmelt and rainfall seep deep into the ground, they can absorb enough of this heat to raise the temperature of the ground water close to the boiling point. Geyser basins and other thermal areas in Yellowstone National Park are places where hot ground water has risen close to the surface. Research drilling at Yellowstone in the 1960s confirmed that the ground water beneath many of the park's thermal areas is very hot. At Norris Geyser Basin, water temperatures as high as 460.F (238.C) were recorded at depths of only 1,090 feet (332 m). Because the boiling point of water increases with increasing pressure and pressure increases with depth, deep water can be hotter than boiling water near the surface. If the pressure that confines this deep water is reduced quickly, pockets of water may suddenly boil, causing an explosion as the water is converted to steam. Such activity drives the eruptions of geysers, like Old Faithful, which are repetitive releases of plumes of steam and water. Rarely, steam explosions are more violent and can hurl water and rock thousands of feet. In Yellowstone's geologic past, such violent events, called hydrothermal explosions, have occurred countless times, creating new landscapes of hills and craters. A recent and notable hydrothermal explosion occurred in 1989 at Porkchop Geyser in Norris Geyser Basin. The remains of this explosion are still clearly visible today as an apron of rock debris 15 feet (5 m) across surrounding Porkchop's central spring. In the 1880s and early 1890s, a series of powerful hydrothermal explosions and geyser eruptions occurred at Excelsior Geyser in the Midway Geyser Basin. Some of the explosions hurled large rocks as far as 50 feet (15 m). Much larger hydrothermal explosions have occurred at Yellowstone in the recent geologic past. More than a dozen large hydrothermal-explosion craters formed between about 14,000 and 3,000 years ago, triggered by sudden changes in pressure of the hydrothermal system. Most of these craters are within the Yellowstone Caldera or along a north-south-trending zone between Norris and Mammoth Hot Springs. Although large hydrothermal explosions are a feature of Yellowstone's recent geologic history, most explosions in historical times have been relatively small and have left craters at most a few yards across. For example, in early 2003, a long linear fissure appeared on a hillside above Nymph Lake, north of Norris Geyser Basin, venting steam and throwing bits of rock onto the surrounding hillside. Although most hydrothermal explosions in the park are small, their remains can be noticed by observant visitors and attest to the nearly continuous geologic activity at Yellowstone. QUESTION: What is the chance of another catastrophic volcanic eruption at Yellowstone? ANSWER: Although it is possible, scientists are not convinced that there will ever be another catastrophic eruption at Yellowstone. Given Yellowstone's past history, the yearly probability of another caldera�forming eruption could be calculated as 1 in 730,000 or 0.00014%. However, this number is based simply on averaging the two intervals between the three major past eruptions at Yellowstone � this is hardly enough to make a critical judgement. This probability is roughly similar to that of a large (1 kilometer) asteroid hitting the Earth. Moreover, catastrophic geologic events are neither regular nor predictable. QUESTION: What is a "supervolcano"? ANSWER: The term "supervolcano" implies an eruption of magnitude 8 on the Volcano Explosivity Index, meaning that more than 1,000 cubic kilometers (240 cubic miles) of magma (partially molten rock) are erupted. The most recent such event on Earth occurred 74,000 years ago at the Toba Caldera in Sumatra, Indonesia. QUESTION: What would happen if a "supervolcano" eruption occurred again at Yellowstone? ANSWER: Such a giant eruption would have regional effects such as falling ash and short-term (years to decades) changes to global climate. The surrounding states of Montana, Idaho, and Wyoming would be affected, as well as other places in the United States and the world. Such eruptions usually form calderas, broad volcanic depressions created as the ground surface collapses as a result of withdrawal of partially molten rock (magma) below. Fortunately, the chances of this sort of eruption at Yellowstone are exceedingly small in the next few thousands of years. QUESTION: Is Yellowstone monitored for volcanic activity? ANSWER: Yes. The Yellowstone Volcano Observatory (YVO), a partnership between the United States Geological Survey (USGS), Yellowstone National Park, and the University of Utah, closely monitors volcanic activity at Yellowstone. The YVO website (http://volcanoes.usgs.gov/yvo) features real-time data for earthquakes, ground deformation, streamflow, and selected stream temperatures. In addition, YVO scientists collaborate with scientists from around the world to study the Yellowstone volcano. QUESTION: Do scientists know if a catastrophic eruption is currently imminent at Yellowstone? ANSWER: There is no evidence that a catastrophic eruption at Yellowstone is imminent, and such events are unlikely to occur in the next few centuries. Scientists have also found no indication of an imminent smaller eruption of lava. QUESTION: How far in advance could scientists predict an eruption of the Yellowstone volcano? ANSWER: The science of forecasting a volcanic eruption has significantly advanced over the past 25 years. Most scientists think that the buildup preceding a catastrophic eruption would be detectable for weeks and perhaps months to years. Precursors to volcanic eruptions include strong earthquake swarms and rapid ground deformation and typically take place days to weeks before an actual eruption. Scientists at the Yellowstone Volcano Observatory (YVO) closely monitor the Yellowstone region for such precursors. They expect that the buildup to larger eruptions would include intense precursory activity (far exceeding background levels) at multiple spots within the Yellowstone volcano. As at many caldera systems around the world, small earthquakes, ground uplift and subsidence, and gas releases at Yellowstone are commonplace events and do not reflect impending eruptions. QUESTION: Can you release some of the pressure at Yellowstone by drilling into the volcano? ANSWER: No. Scientists agree that drilling into a volcano would be of questionable usefulness. Notwithstanding the enormous expense and technological difficulties in drilling through hot, mushy rock, drilling is unlikely to have much effect. At near magmatic temperatures and pressures, any hole would rapidly become sealed by minerals crystallizing from the natural fluids that are present at those depths. QUESTION: Could the Yellowstone volcano have an eruption that is not catastrophic? ANSWER: Yes. 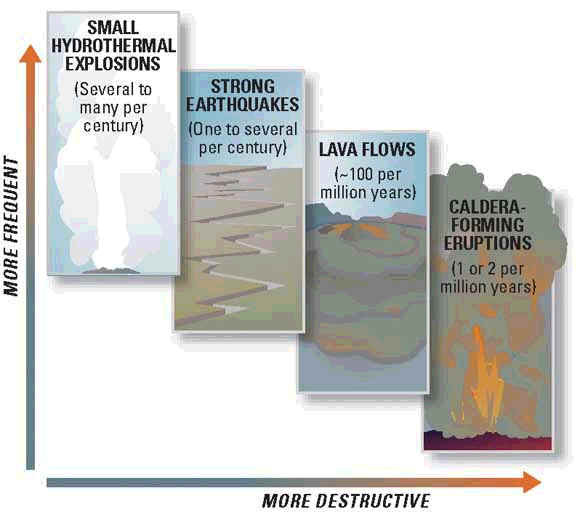 Over the past 640,000 years since the last giant eruption at Yellowstone, approximately 80 relatively nonexplosive eruptions have occurred and produced primarily lava flows. This would be the most likely kind of future eruption. If such an event were to occur today, there would be much disruption of activities in Yellowstone National Park, but in all likelihood few lives would be threatened. The most recent volcanic eruption at Yellowstone, a lava flow on the Pitchstone Plateau, occurred 70,000 years ago. QUESTION: Because Yellowstone is so geologically active, are there other potential geologic hazards in Yellowstone? 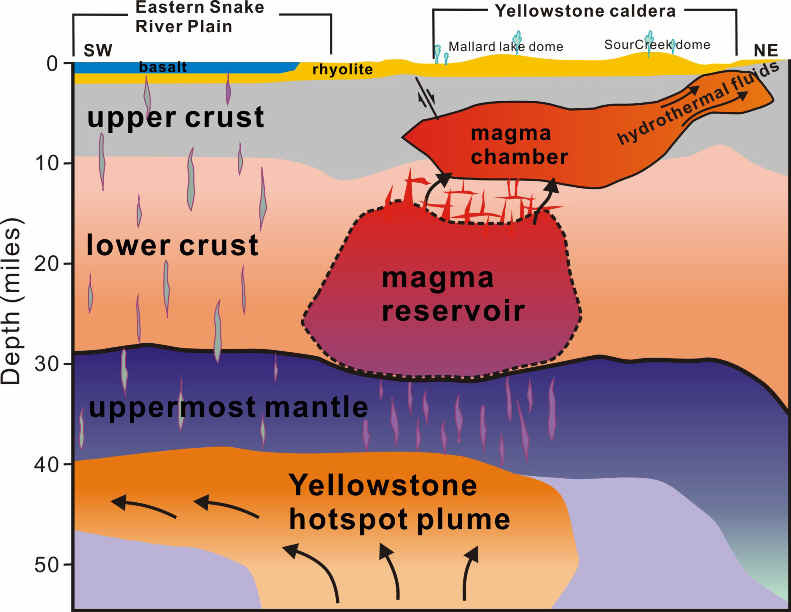 April 23, 2015 – University of Utah seismologists discovered and made images of a reservoir of hot, partly molten rock 12 to 28 miles beneath the Yellowstone supervolcano, and it is 4.4 times larger than the shallower, long-known magma chamber. The researchers emphasize that Yellowstone’s plumbing system is no larger – nor closer to erupting – than before, only that they now have used advanced techniques to make a complete image of the system that carries hot and partly molten rock upward from the top of the Yellowstone hotspot plume – about 40 miles beneath the surface – to the magma reservoir and the magma chamber above it. “The magma chamber and reservoir are not getting any bigger than they have been, it’s just that we can see them better now using new techniques,” Farrell says. The researchers point out that the previously known upper magma chamber was the immediate source of three cataclysmic eruptions of the Yellowstone caldera 2 million, 1.2 million and 640,000 years ago, and that isn’t changed by discovery of the underlying magma reservoir that supplies the magma chamber. “The actual hazard is the same, but now we have a much better understanding of the complete crustal magma system,” says study co-author Robert B. Smith, a research and emeritus professor of geology and geophysics at the University of Utah. The three supervolcano eruptions at Yellowstone – on the Wyoming-Idaho-Montana border – covered much of North America in volcanic ash. A supervolcano eruption today would be cataclysmic, but Smith says the annual chance is 1 in 700,000. The study in Science is titled, “The Yellowstone magmatic system from the mantle plume to the upper crust.” Huang, Lin, Farrell and Smith conducted the research with Brandon Schmandt at the University of New Mexico and Victor Tsai at the California Institute of Technology. Funding came from the University of Utah, National Science Foundation, Brinson Foundation and William Carrico. Yellowstone is among the world’s largest supervolcanoes, with frequent earthquakes and Earth’s most vigorous continental geothermal system. The three ancient Yellowstone supervolcano eruptions were only the latest in a series of more than 140 as the North American plate of Earth’s crust and upper mantle moved southwest over the Yellowstone hotspot, starting 17 million years ago at the Oregon-Idaho-Nevada border. The hotspot eruptions progressed northeast before reaching Yellowstone 2 million years ago. — Previous research has shown the Yellowstone hotspot plume rises from a depth of at least 440 miles in Earth’s mantle. Some researchers suspect it originates 1,800 miles deep at Earth’s core. The plume rises from the depths northwest of Yellowstone. The plume conduit is roughly 50 miles wide as it rises through Earth’s mantle and then spreads out like a pancake as it hits the uppermost mantle about 40 miles deep. Earlier Utah studies indicated the plume head was 300 miles wide. The new study suggests it may be smaller, but the data aren’t good enough to know for sure. — Hot and partly molten rock rises in dikes from the top of the plume at 40 miles depth up to the bottom of the 11,200-cubic mile magma reservoir, about 28 miles deep. The top of this newly discovered blob-shaped magma reservoir is about 12 miles deep, Huang says. The reservoir measures 30 miles northwest to southeast and 44 miles southwest to northeast. “Having this lower magma body resolved the missing link of how the plume connects to the magma chamber in the upper crust,” Lin says. 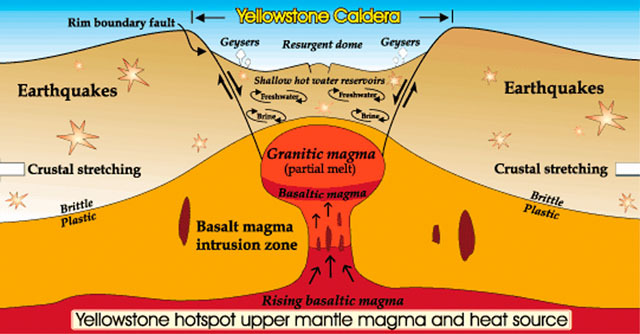 — The 2,500-cubic mile upper magma chamber sits beneath Yellowstone’s 40-by-25-mile caldera, or giant crater. Farrell says it is shaped like a gigantic frying pan about 3 to 9 miles beneath the surface, with a “handle” rising to the northeast. The chamber is about 19 miles from northwest to southeast and 55 miles southwest to northeast. The handle is the shallowest, long part of the chamber that extends 10 miles northeast of the caldera. Discovery of the magma reservoir below the magma chamber solves a longstanding mystery: Why Yellowstone’s soil and geothermal features emit more carbon dioxide than can be explained by gases from the magma chamber, Huang says. Farrell says a deeper magma reservoir had been hypothesized because of the excess carbon dioxide, which comes from molten and partly molten rock. As with past studies that made images of Yellowstone’s volcanic plumbing, the new study used seismic imaging, which is somewhat like a medical CT scan but uses earthquake waves instead of X-rays to distinguish rock of various densities. Quake waves go faster through cold rock, and slower through hot and molten rock. The Utah seismic network has closely spaced seismometers that are better at making images of the shallower crust beneath Yellowstone, while EarthScope’s seismometers are better at making images of deeper structures. “It’s a technique combining local and distant earthquake data better to look at this lower crustal magma reservoir,” Huang says.